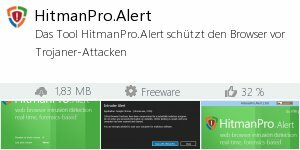 Das Tool HitmanPro.Alert schützt den Browser vor Trojaner-Attacken. Internet Explorer, Chrome, Firefox, Opera, Maxthon, Comodo Dragon, Pale Moon, Tor Browser, Avant Browser, Baidu Spark Browser, SRWare Iron and Yandex Browser. Supported on 32-bit and 64-bit versions of Windows 8, Windows 7, Windows Vista, Windows XP, Windows Server 2012, Windows Server 2008 and Windows Server 2003.